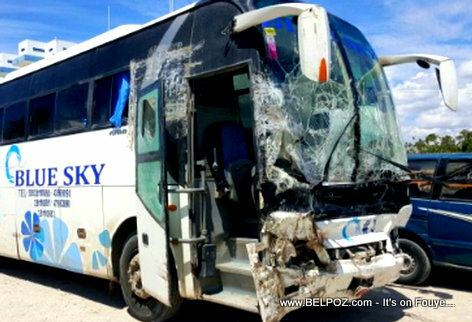 According to news reports, the Blue Sky company bus had just gotten into an accident hitting two people and killing one of them, the bus driver decided to run from the accident only to run into 3 "BAND RARA" a few miles away killing more people. Mwen mandé bondyé gérizon pou 2 moun bus la té frapé a, plis gren moun sak pèdi lavil la. It is unfortunate that these bus companies think that they are not responsible for their acts. I am also a victim of a similar situation. One of the bus companies "Sunshine Tours" hit my car from behind, totaled it. Its been seven months since the accident, they have not reported the accident. In the meantime, they repaired their bus an had it back in traffic.